livinghistory.ie • View topic - Help! what is this armour? Help! what is this armour? need to find this out as quick as possible, what type of armour is represented here? it looks like a series of bands, like a roman lorica segmentata, is it metal? i've seen banded skirts like that, but this extends all the way to the chest. is it an odd representation of a coat/jack of plates? really need help with this, thanks in advance. Re: Help! what is this armour? I think it's banded armour. Never seen it in a medieval context for torso armour, but it's pretty common for skirts and shoulders. Though, if I were making it, I'd rivet the bands onto vertical leather strips, and there are no rivet marks on any of the bands. It's also over mail, so unlikely to be a gambeson - though remotely possible. It's a question worth posting on armourarchive.org, I think. I'll do that, and report back! Actually, as a followup; on sundays there is a small market in Howth Castle. Not that it's a great market, but you do get to look around the back of the castle (which is usually closed to the public). Around the back are the older bits, maybe 12th or 13th century, that are slowly falling apart, and what seems to be a detacted 18thC chapel in a small wood, whose roof seems to have collapsed sometime in the 20thC. It's quite a massive building; no wonder the current St. Laurences only need to live in the small part of it they can afford the upkeep on. The walled gardens are also quite extensive, and seem to be just locked up & let go wild. Shame. 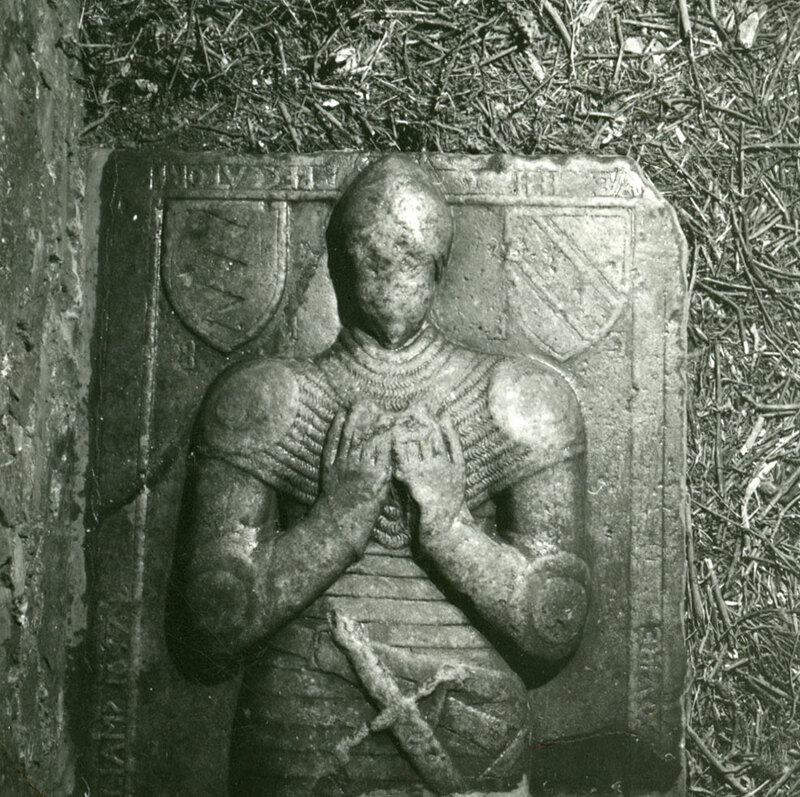 Here's another example of the same armor: Church of Ireland Church, Lusk, County Dublin - Effigy of James Bermingham. Think i'm going to have agree with the suggestion of the banded armour, never seen anything like it before though. i doubt it was quilted armour like a gambeson as suggested on AA, there are representations of that on other effigies (with vertical quilting), and that looks nothing like this. According to the source I used above, "His corset comprises horizontal lames secured to a canvas or leather foundation by sliding rivets, and is worn in conjunction with plate arm and leg harness, a mail haubregeon and a mail pasaine to which circular pauldrons are attached." He also states that, "Surviving monuments confirm the archaic armour of this type predominated amongst the 'degenerate English' (Piers Butler, Earl of Ormond is used as an example) of Ireland until the 1550s." They would date, from tomb art, to also have been used in the 1400s and earlier. This is NOT an Acton or Cotun/Gambeson, which appears very differently in tomb art. The last example you posted actualy shows the rivets. Very detailed carving on that one! Brendan, Finn, great research. That is what this forum is for! Finn, what source were you citing for detail on the armour ? I've been talking of getting a harness commissionned for years. Something distinctively irish, and 15thC might be just what I needed to kick off the process. a great discussion alright, and definitly a type of armour i'd like to see on a battlefield at some stage.